Last August (2009) I received a copy of the only magazine that I currently subscribe to and the cover had a picture of the coin shown above. Anyone capable of minting coins can be as creative as they please. This coin, however, is one that represents the goal of a few elites, and it received the publicity and approval of an important world leader. “The world in a coin. This is our vision, our hope. It is a necessity and a challenge. What seems an impossible dream becomes an inevitable historic, economic and social process. It is an event which is intertwined with the fate of human evolution. "‘J'aimerai avoir la monnaie du futur. Parce qu’avec cet petit objet rond, je sentirai le monde entier entre mes mains". 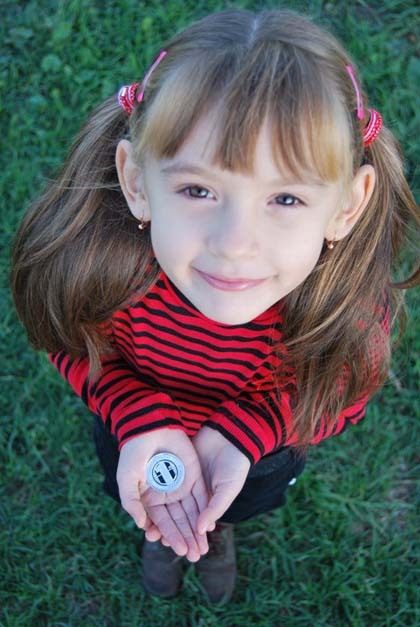 "I would love to have the coin of the future. Because, through this small round object I will feel all the world in my hands". -Sasha, nine years old, France. I never thought I would hear a Russian leader say such words. And they didn’t seem to bother the other world leaders meeting at the G-8 summit either. There are many who are not aware of this story. Last week, Mr. Medvedev made a few comments about the New World Order in an interview. His comments were not nearly as telling as the statement he made last July. Part of the reason I’m posting this story now was the bump that the stock market felt last week. It seems that a trillion dollars was lost on paper in just a few minutes. The following financial report makes it appear that everything is fine, that all is under control. However, it notes that changes must be made. The report says something that is not only being articulated in financial circles these days. Remarks like these are being made in political and religious meetings. “After such a traumatic shock to the global economic and financial systems, it is unlikely the world will return to its pre-crisis state. The failures and their fixes have altered the landscape. Thus, traditional methods of analysis may need to be modified. Ten years ago, I never thought I would hear words like these in my lifetime. I know that President Bush Sr. mentioned the term “New World Order” several times, but few at the time took the man seriously. I don’t know how soon there will be a one world “currency,” but the Bible tells of a time where there will be a method whereby all buying and selling will be monitored. 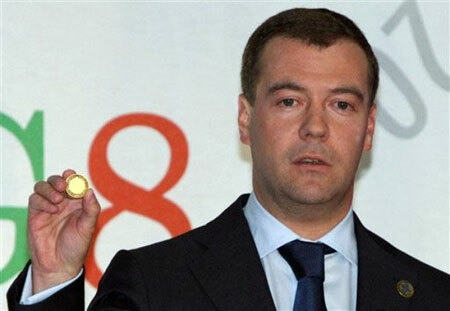 A Russian leader holding up a coin that indicates a willingness to join with all nations economically; it’s almost unbelievable, but it fits well with Bible prophecy. This is where I may lose those of you who are still reading this, but I’ll take that chance. There was a Hebrew prophet named Daniel who had a dream before 500 B.C. It’s recorded in the Old Testament book of Daniel in chapter 7. The dream was about a lion, a bear, and a leopard. There are many different views of the meaning of this dream. Many would say that relating things in a dream that’s 2500 years old to events occurring in our time is, simply, egotistical. Because of where we are in time, we naturally have an egocentric view of things. In this case, however, there are valid reasons to link the dream with current events. 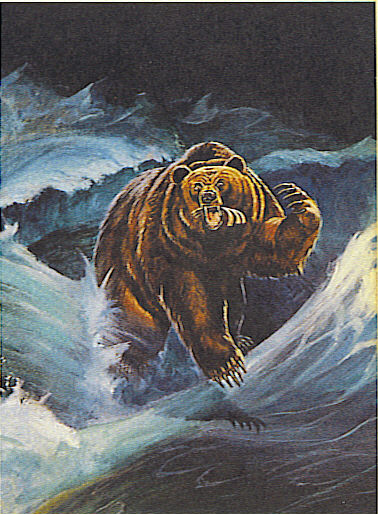 I think that the bear in the dream represents the Russia of the modern era. I wouldn’t bet my life on it, but I think it is the best view of many given by Bible scholars. Dr. Henry Morris, Gary Stearman, and J. R. Church are a few who think that this is a good possibility. You can see why the above stories intrigue me. Together with other Bible prophecies that point to a one world government, things happening in our time are fascinating. So much for my opinion. Write a comment and share yours. This entry was posted on Sunday, May 9th, 2010 at 11:43 PM and is filed under Bible Prophecy, BIG GOVERNMENT, Commentary. You can follow any responses to this entry through the RSS 2.0 feed. You can leave a response, or trackback from your own site.